The attack being used against Mount Pajamaja. Drill Stomp is a technique performed by Giant Luigi in Mario & Luigi: Dream Team. The move icon is a large green drill underneath a small red drill. 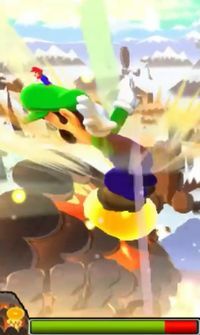 The attack starts when Mario jumps off of Giant Luigi and spins in the direction the player draws circles in, Giant Luigi spinning in the opposite direction. With each stomp, Mario and Giant Luigi come crashing down on the enemy while spinning in opposite directions. The direction to make Mario spin in is shown on the touch screen in the form of an arrow at the end of an incomplete circle, telling the player which way the circles should be drawn. The direction is never clockwise or counter-clockwise all three times. The first stomp would get the player a "Good!" rating, the second a "Great!" rating, and the third an "Excellent!" rating. If the player is unable to get the former two ratings on the first two jumps, the attack will end prematurely, and as such, not deal maximum damage. Like the Rhythm Mushroom, Mario will be exhausted after the attack. The move being selected in battle. The action command the player must perform to increase the move's effectiveness. If the player attacks Earthwake with the Drill Stomp while Earthwake has the head armor, the attack will act like a jump even if it was a successful attack. This page was last edited on November 30, 2017, at 03:25.